I was reading an article by Scott S. Powell for Investors Business Daily and posted by Big Government's editorial board on their website and thought something was interesting. The article discusses Ayn Rand's book, "Atlas Shrugged," and and makes the case that the story was prophetic, describing what is going on today, but what caught my attention was the first paragraph. 'Atlas Shrugged" — Ayn Rand's fourth and last novel, published in 1957 — may be second to the Bible as the most influential book read in America, according to a Library of Congress survey. It is required reading in management training at BB&T, the 12th-largest bank in the U.S. and one that resisted taking TARP bailout funds. After reading the last sentence, I scratched my head and felt compelled to read about BB&T - after all, I thought it would be interesting to read about a bank that adheres to the teachings of Ayn Rand and resisted taking a bailout. When I typed in "BB&T" in Wikipedia, I was surprised to read that the bank had accepted TARP funds. Their reasoning for accepting the government money was because the government urged them to and they would be placed at a competitive disadvantage if they had not accepted the cash. Bob Denham, BB&T's senior vice president of corporate communications, said, "First of all, we strongly oppose the TARP infusion plan. However, we were faced with two undeniable facts: One, BB&T was very strongly encouraged by the Treasury to participate. Obviously the Treasury's purpose at this time is to create liquidity in the market and they obviously want all the banks that are able to do that. Secondly, a refusal to participate would have placed us at a competitive disadvantage. "That said, while we may not like the rules, we're obligated to perform the best we can in the current environment no matter how difficult or unfair the playing field," Denham said. "We don't see it as a breach of integrity to run our business for profit, do what's right for our clients and reward our shareholders even when the actions of the government run contrary to the ideals of a free economic system. "The bottom line is we have an obligation to our shareholders to perform," he said "Interestingly, we're one of the few banks - although the whole economy is suffering and we've all had liquidity problems - BB&T is one of the few banks that are doing well relative to the financial industry. To have allowed our peers to take an injection of capital without our participation would have been a disservice to our shareholders and to our obligation to run our business the best we know how. The Senior Vice President, while admitting that the bank had some liquidity problems, accepted money he was opposed to because he felt it would place him at a disadvantage, and then called the situation unfair - wouldn't accepting the money have corrected the matter, making it "fair?" Being a business with principles, one would suspect the bank never to touch the funds and operate as freely as they would have before - don't forget they claimed to have been perfectly okay in comparison to the rest of the financial industry. "I'll tell you what the TARP money has also done," Denham said. "It has essentially propped up a number of acquisition prospects that might have been available to us." Sounds as if Denham had no problem being subsidized by the government. Essentially, it is very easy for someone to attack the government for their bailout while at the same time receiving the bailout. If they didn't need the bailout, why did they accept it? Ford never accepted a bailout like the other automotive companies, even though they could have. What is interesting is that after reporting a 37% drop in quarterly profits back in 2009, which was still a little bit ahead of projections, BB&T had decided to try and repay the TARP funds as quickly as possible, claiming the funds were "destructive" to their business - I guess the deteriorating housing market had nothing to do with their credit crunch. The bank decided to cut dividends to repay the TARP funds because they could no longer afford their current payout of 47 cents a share. Does that sound like a company that didn't need the TARP funds? They couldn't even pay back the government without cutting dividends! With all that being said, I return to the original Big Government post - what else did Powell have to say? What happened in Rand’s narrative is coming to pass today, with an anti-business administration reviling private industry and capitalizing on crisis to expand and redirect investment within and between sectors of the economy — setting quotas, prices and compensation. Businesses responded by retrenching — ceasing to invest, innovate and expand. Whole industries contracted, closed down or moved offshore, much like the U.S. gas and oil drilling industry is doing today. Then, just as now, management became frustrated, discouraged and reluctant to create jobs in an environment of excessive government meddling. Powell claims that government regulation is strangling business, preventing investments and innovation. He claims management is "frustrated, discouraged and reluctant to create jobs" but what supporting evidence does he give? Powell gives vague warnings of government takeovers - schools are plagued with teachers unions and consistent failings, "ObamaCare" will expand "unionization, entitlement, and dependency" - he even points to media sensationalism as a contributing factor to the spread of the administration's agenda, but Powell fails to give any specifics. Essentially, Powell is giving Rand the Nostradamus treatment, claiming the all-wise Rand had predicted the Obama administration nearly 60 years ago. 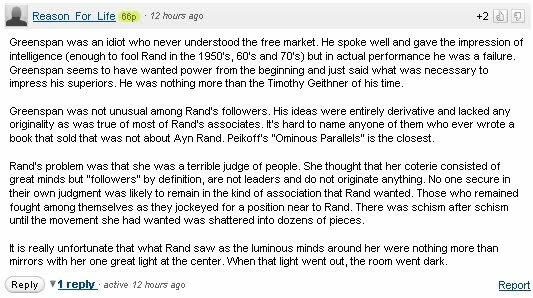 He goes on to write that Obama had done one thing right - bring attention to the failures of liberalism which will undoubtedly revive Rand's vision. Fortunately, the catalyst for course correction is around the corner. Ironically, President Obama can be thanked for making this midterm election an overdue referendum on liberalism. Average Americans are now more informed and engaged than they have been in generations, and they are highly motivated to vote. I assume Powell is making a veiled reference to the tea parties when he talks about "average Americans" being "informed and engaged," but what is his definition of "informed?" Fox News? Breitbart.tv? Big Government? That is what the tea party definition of informed would be - they have been trained to disbelieve anything from any other news source. Let's look at some of the comments left by some of these newly "informed and engaged." 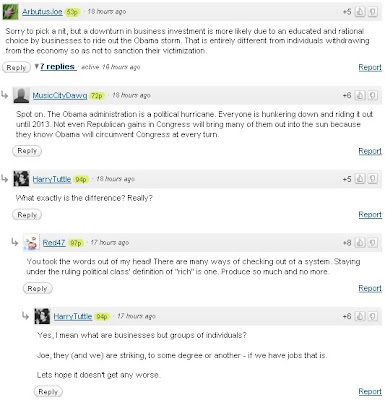 Here is an "informed" comment that believes the administration is planning to take control of corporate "idle cash." Wow. 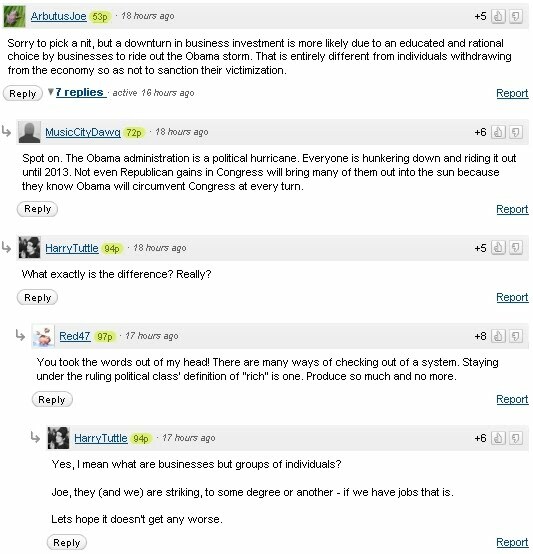 These group of "informed" people believe businesses are not investing because people are waiting until 2013, when supposedly Obama will leave office. If that is the case, and government intervention in the markets was the cause for a downturn in economic investment, then what was the deal with the VP of BB&T stating the TARP funds opened up some opportunities for the bank? 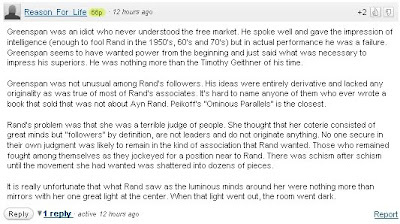 These comments focus on Alan Greenspan because obviously it was his intentions to fool both Ayn Rand and good conservatives for years in trying to destroy the economy and set up a socialist government. These comments are about as well-informed and rational as the claims that Obama was born in Kenya and has been groomed since birth to be a subversive communist president. Basically, Powell has got it all wrong - Americans remain uninformed but are engaging in politics on false notions propagated by the conservative media. His article was vague, and at times contradicting, and gave no specific example to back up his claims. What would Powell think of candidates against the "deficit- and debt-reduction" associated with the expiration of the Bush tax cuts? Would he come out against the GOP hypocrisy and fight against allowing the tax cuts to remain? He claims that "the most credible and successful candidates, whether incumbents or new entries, are likely to be those resolutely committed to deficit- and debt-reduction and getting government out of the way of private-sector job creation." He also claims that it is the current administration's policies that are inhibiting growth. Past policies or the current administration?